Welcome to our Friday guest post and it is the ever amazingly talented Zoe Hillman who has designed and created a very special project for us today whilst in the throes of moving house. Just scroll through and see what exciting materials and layers Zoe has used to create her 'Sew Special' mini clipboard. Hello! Zoe here! I am delighted to be a guest at A Vintage Journey today. I am British and currently living in Geneva, Switzerland with my husband Neil, (for another 4 days anyway)! I moved here 8 years ago and we are now off to Copenhagen, Denmark to start a new adventure together. It was shortly after moving to Switzerland that I picked up Tim Holtz’s Compendium of Curiosities book and was instantly hooked! I love Tim's style, he's such a talented designer and great educator. I am utterly obsessed with distress and never happier than when I have inky fingers. I really enjoy being part of the online craft community and love social media. I have “met” so many lovely people through a mutual love of craft, who provide such encouragement and inspiration. Crafting is definitely my happy! Today I am sharing a project inspired by the Sew Special challenge. This tape measure ribbon covered the "stitched" part of the challenge! 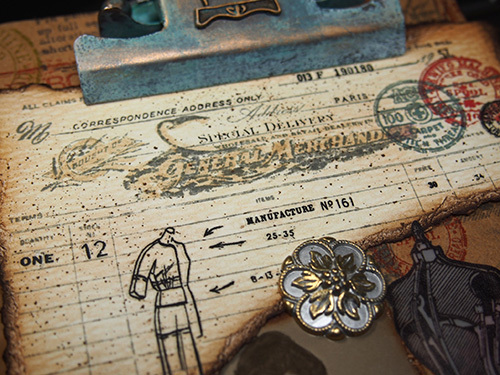 I then created a faux vintage pattern tissue using the new substrate material by Tim Holtz. To make the substrate thinner and more tissue like, split the substrate by peeling the front and back layer apart. 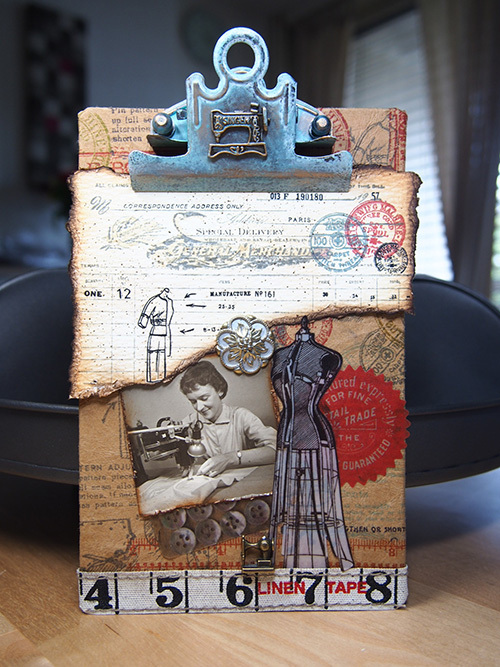 Next, stamp with sewing themed stamp sets, (both by Tim Holtz), using various archival inks, (by Wendy Vecchi). To make the substrate look distressed, screw up gently until supple. 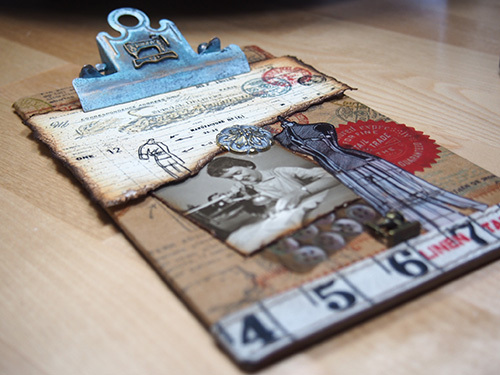 Next, remove the clip from a Tim Holtz mini clipboard and adhere the substrate, wrapping it around the back. The linen tape measure ribbon covered the bottom of the board where the substrate didn't reach. To alter the clip, cover with picket fence distress paint and rub away when almost dry. Rub evergreen bough distress ink between your thumb and forefinger until almost dry, then rub onto parts of the clip. Finally rub on some gold gilders paste to highlight. I added a singers sewing machine charm from my stash. 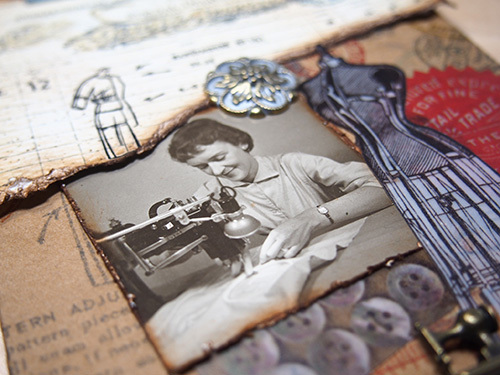 Collect together some sewing themed ephemera, mine was from the vellum thrift shop ephemera pack, (by Tim Holtz) and a photograph I picked up whilst junking recently. It was top of the pile and PERFECT for this project. 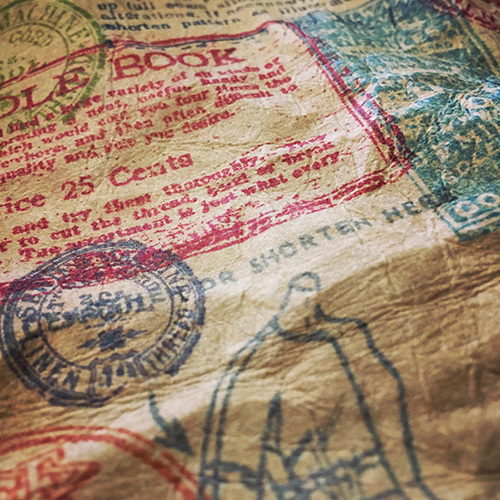 I created a dress shop receipt using a stamp from the Tim Holtz Curiosities set. Adding remnant rubs to give detail to the receipt and indicate a dress shop alteration. Tear and ink the edges with walnut stain distress ink to give an aged look. Thanks for taking a look at my project and to the team at A Vintage Journey for having me. 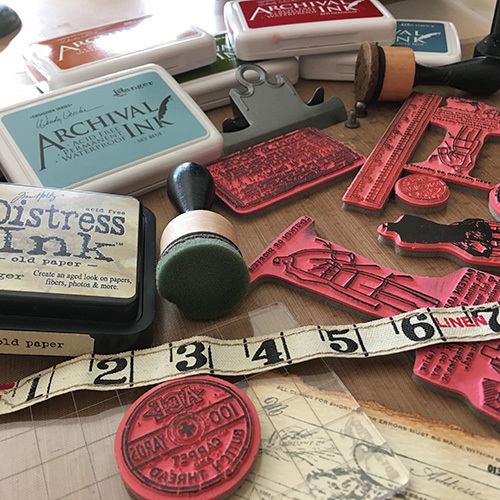 Oh wow Zoe what a fabulously creative make for our Sew Special challenge and what an amazing vintage feel you have created with the stamp sets and your wonderful photo. Every step you took to bring this project together is brilliant but the part that excites me the most is the dress shop receipt, it's perfect. Thank you for taking time out of your very busy schedule to make this delightful and inspirational work of art and for sharing it with us at A Vintage Journey. Thanks to you our readers for popping in today and if you haven't yet joined us in the challenge I hope you are inspired to give it a go and share your own inspiration with us. You have until next Thursday evening to link up and then midnight (UK time) on Friday morning we will be starting the next theme. We will also be back on Monday with the fourth Destination Inspiration post for May, we look forward to catching up with you then. Welcome Zoe . 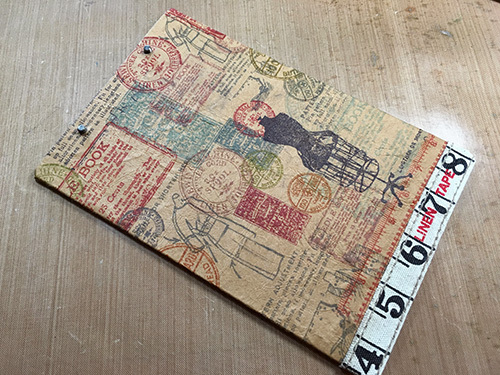 Your altered mini clipboard is fabulous and just perfect for this months challenge theme. Loving the look of the substrate material and what a fantastic background you have created with all that stamping. Wonderful junk find photo and can see why it was top of your 'to use' pile . Love the singer sewing machine charm too. A fantastic creation, Zoe - and wonderful to have you here as our guest this month. 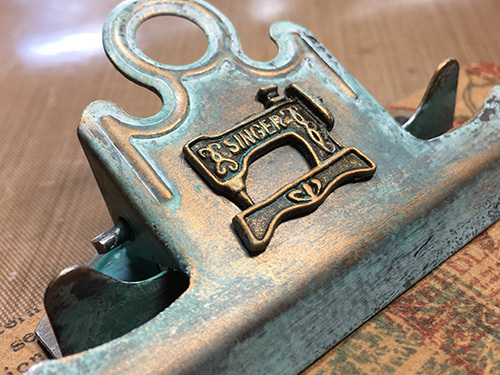 Gorgeous altering of the metal file clip - the paint/ink/gilding works a treat for that vintage look - and it's all the more impressive given your stash is already part-packed for the move. Good luck with it all - I'm sure you'll love Denmark! I love this project Zoe!! I have some of that substrate material (hoarding it I am!).. must dig it out to play! Oh my goodness! 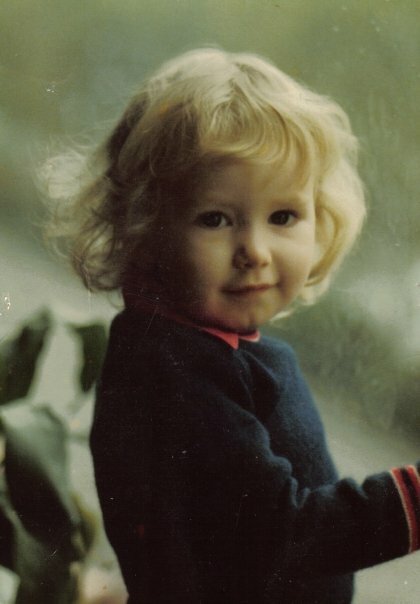 Young Zoe looks just like a blonde version of my Mom! Wow. Vintage elegance Zoe. A wonderful project with super techniques and detail. Love it ! Wow, Zoe! You sure did pull a rabbit out of a hat with this amazing make! To think most of your creative stash was packed away, you still managed to make this detailed sewing clipboard appear as if every product were made especially for it! (I do hope that made sense!) Love the stamped substrate the best--pure brilliance on your part! Just an amazing project start to finish and you wrote a wonderful and informative tutorial! Thank you for sharing this in the midst of your tremendously busy schedule! Best of everything with your new adventure and the move in getting there! Hugs! PS Your photo is just delightful!